If you have a wood-burning fireplace, chances are you have firewood, right? Unfortunately, that also means you need place to store it! If you are like me, you want the firewood nearby so you don’t have to trek out to a cold shed through a snowy yard, but you don’t really want it inside. Firewood is dirty, it brings in some bugs and unless you live in a rustic mountain cabin, chances are it doesn’t do much for your style. But then if you store it stacked outside, you need to make sure it doesn’t trap moisture between it and the side of the house or become a perfect home for vermin in the garage. Oh, yes, on top of all that, you want it to stay off the ground so it doesn’t get waterlogged! 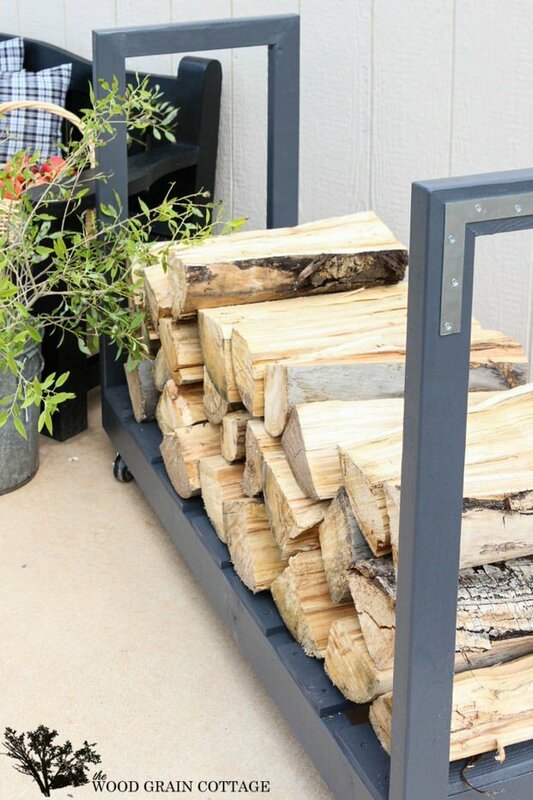 So the perfect solution are these super easy DIY outdoor firewood racks. You can store your wood close, clean, and dry and it allows you to buy wood in bulk, saving you money. Time to “fire” up the DIY! From Shayna (and Anthony!) at ‘The Wood Grain Cottage‘, this DIY rolling firewood rack is perfect for storing your wood where you can easily get to it, but can be rolled out of the way as well. (BTW this also makes it easy to clean around and behind your wood pile, which helps prevent little furry creatures from settling in!) Lots and lots of step by step photos in this really clear tutorial. Our next project is from our favorite woodworking girl, ‘Ana White‘. Build a firewood rack with some simple connectors, and get free plans for this project from ‘DIY Done Right‘! From the forum ‘BBQ Brethren‘, this DIY outdoor firewood rack was submitted by one of their readers, complete with plans! We love this because you can probably make it with things laying around your garage…and it does a great job of keeping the wood off the ground, which is great for areas with lots of snow. 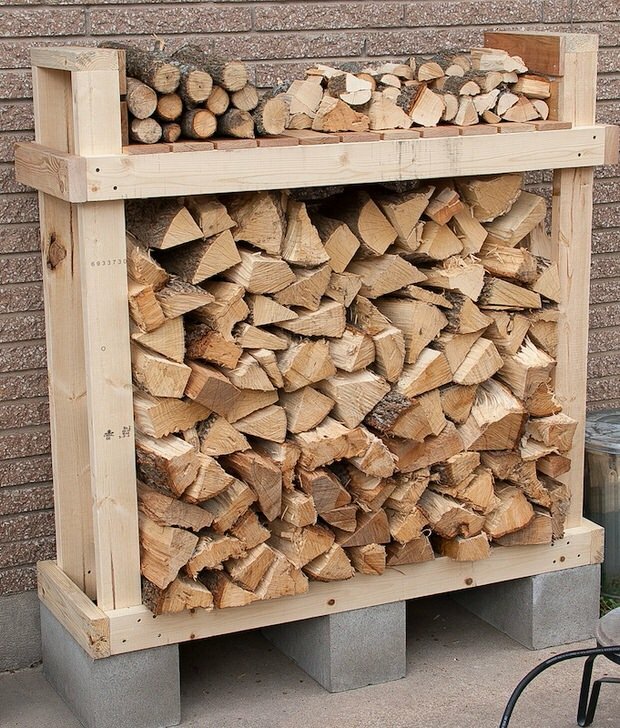 Want to know how to build a firewood rack the easy way? Check out these next two creative ideas. This one from ‘Instructables‘ uses no tools to construct. Pretty clever design! And this one is one of our favorite DIY outdoor firewood racks, and a smaller version of the above project. Found on ‘Homedit‘. This is simply cinder blocks and scrap 2×4’s! 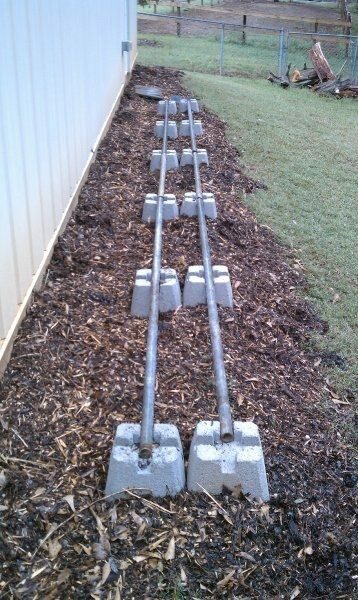 This idea from ‘Metal Garden Beds‘ is smart and simple. 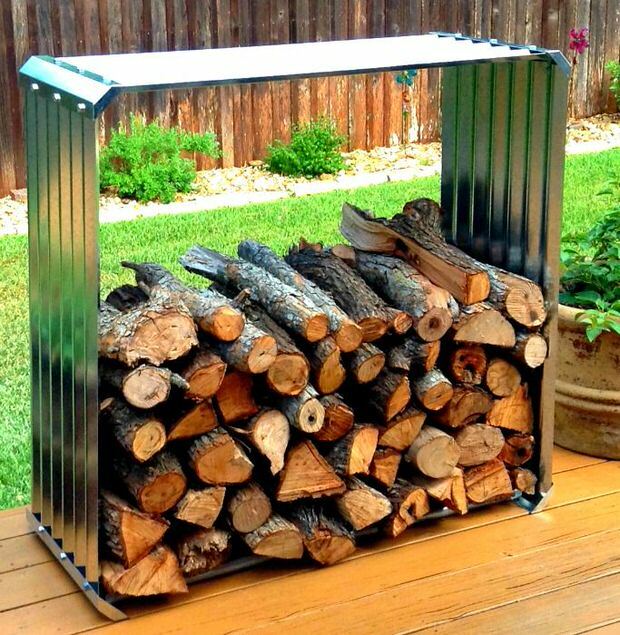 They simply took a corrugated metal raised bed frame and turned it on its side… Instant outdoor firewood rack! 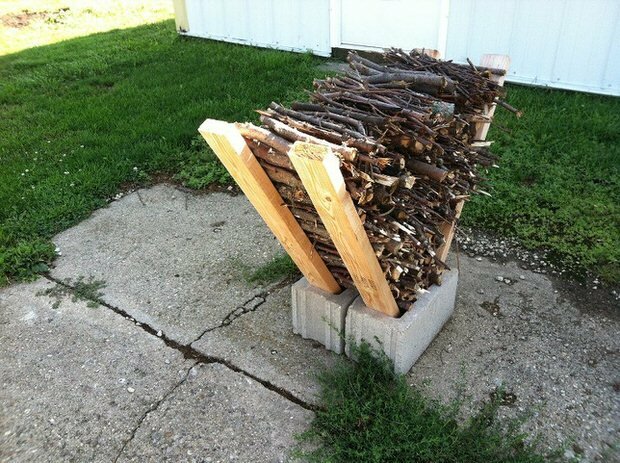 This is a simple DIY firewood rack we found on ‘Indulgy‘… Just lay pipe on top of concrete footings from the home improvement store, then stack your wood! Great economical way to keep your wood off the ground and draining properly from the weather. Need one more idea on how to build a firewood rack? Ok we gotcha. 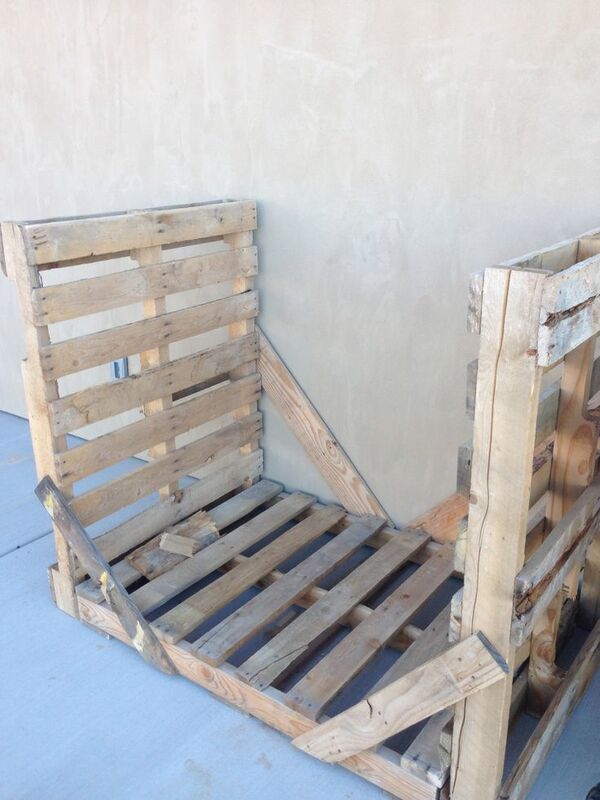 Uploaded by a user on Pinterest, this firewood rack diy is simply three empty wood pallets, joined by wood braces. We suggest using screws, not nails, but even scrap wood will work! Brace both sides of the rack. Great upcycling! This next outdoor firewood holder is kind of a semi-DIY project. You can get this DIY firewood rack bracket kit from ‘Wayfair‘ and then add six 2×4’s to make your own firewood rack in just a few minutes. So simple! 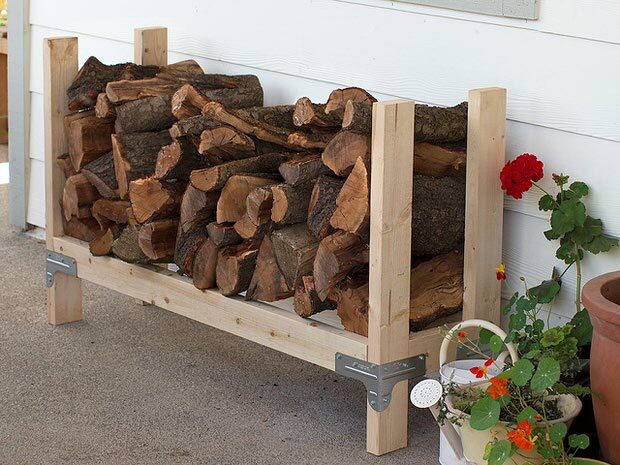 Get motivated and tackle one of these DIY outdoor firewood racks today! 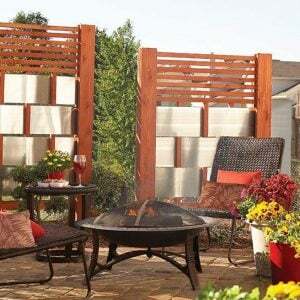 If you are looking to buy an outdoor firewood holder or rack, then you can browse some great selections at ‘Wayfair‘. 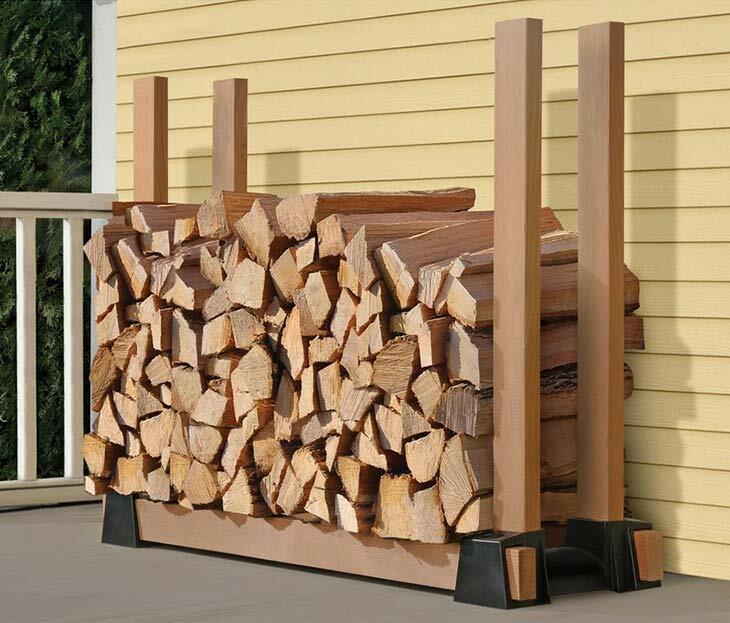 Or, you can check out these great firewood rack ideas we found for you in a few different price points. If you want a small firewood holder for your patio, ‘the “Slaughter Firewood Rack” might be what you are looking for. This not only looks cool, it is made of sturdy powder coated steel as well. 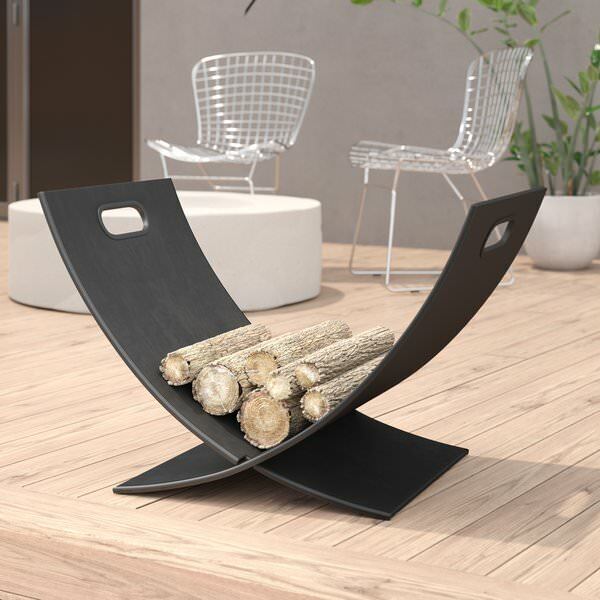 You can use this firewood holder indoors or outdoors. 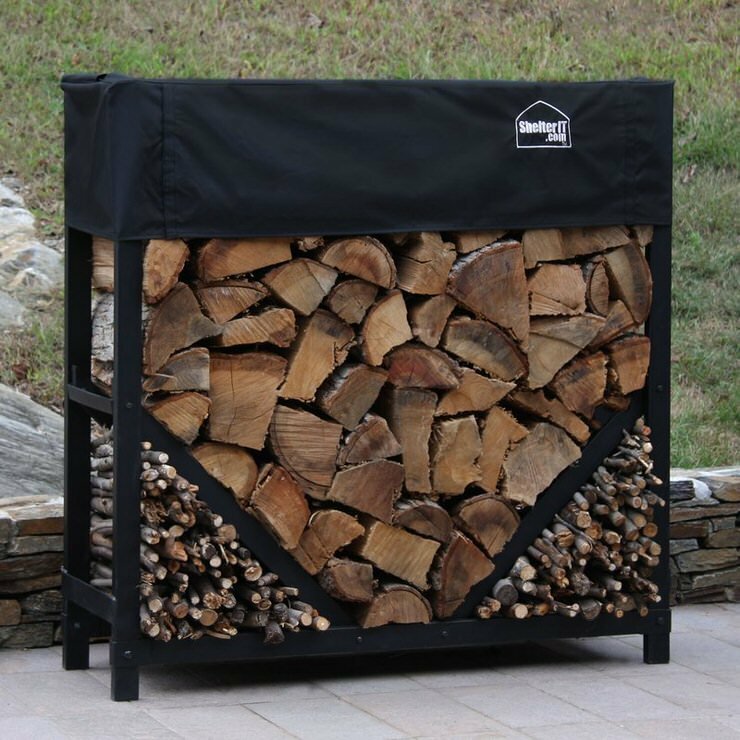 A mid priced firewood rack that looks good and has a cover to keep that firewood dry is the “Straigth Firewood Rack“. Loving how you can stack kindling in it’s own space in the rack for easy access. 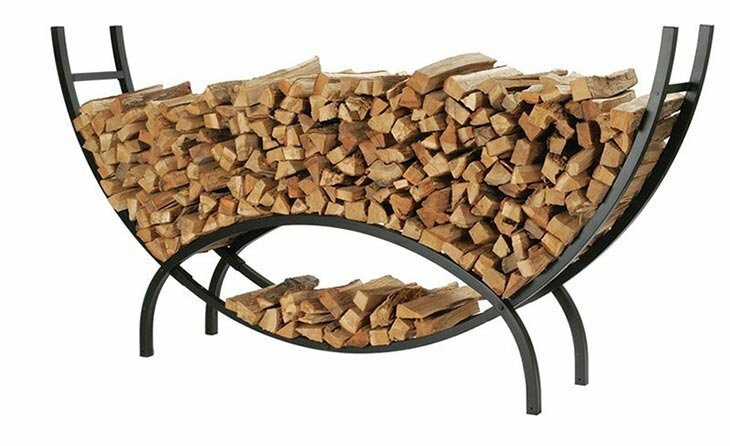 If you are looking to spend a little bit more for a log rack that is attractive and practical, then you might want to check out the “Crescent Log Rack“. Powder coated steel with tons of 5 star reviews. 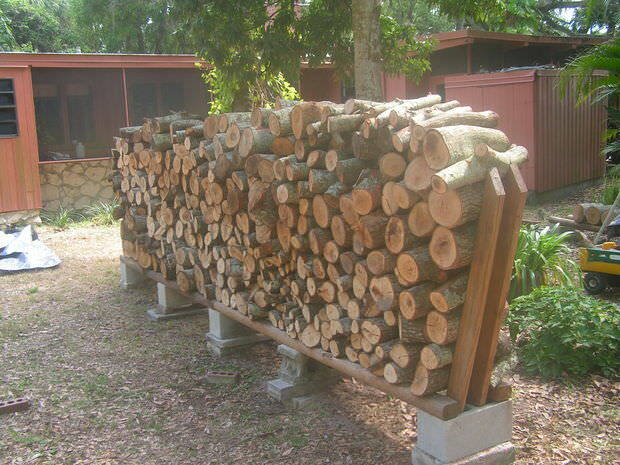 We hoped you enjoyed our post on firewood racks! Based on this post, you might be interested in our post on DIY Greenhouse Projects, DIY Tabletop Fire Bowls or How to Build a Backyard Fire Pit! 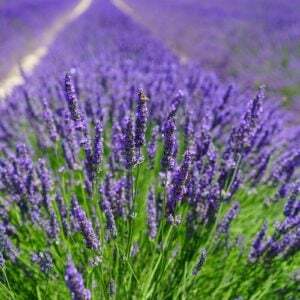 ← How To Grow Lavender Like the French! How To Grow Lavender Like the French! They aren’t “cinder blocks”. They’re concrete blocks or concrete masonry (not “masonary”) units. Cinder blocks contain fly ash or bottom ash and were historically used as light weight, light duty structural units and as flue liners. They are not in common use today. Great article! I love this topic and found a few new ways to store wood. Thanks, and have a great 2017! I really enjoy these pins. I plan to use several of them myself for keeping my wood up off the ground and keeping it looking good at the same time! !